New Delhi, May 22: The 'Peace spreaders' and entities who claim to 'serve mankind', are desparately attempting to wipe out the NDA govt led by Prime Minister Narendra Modi. In each election, one particular entity comes out 'nakedly' and jumps into the political arena to expose its presumptuous nature peculiarly against Modi and the BJP. In most recent incident, it is the Archbishop of Delhi that has issued a flagrant controversial letter asking all the ‘Fathers, Brothers and Sisters’ to hold prayer meetings and fasting to nullify the threat to “democratic principles and secular fabric” of our nation threatened by “the turbulent political atmosphere”. Archbishop of Delhi Anil JT Couto called on the faithful in every parish to recite the prayer and fast for a year starting May 13, 2018 and perform the Eucharistic adoration every Friday until the 2019 elections. Citing many such vociferous and wicked attempts of the Christian Groups who are desparately trying to castrate the political wisdom of their disciples and believers, the Legal Rights Observatory, a Democracy watchdog has knocked the doors of the Election Commission of India and called for a might to uphold principle of model code of conduct by punishing the guilty. In a letter sent to the ECI, LRO Convener Vinay Joshi has slammed the body for its languorous approach to tackle the Christian groups which are tampering the very spirit of democracy by spreading nefracious propoganda. In the letter Vinay Joshi states: 'lackadaisical approach and shoddy mechanism of dealing with such crimes has bolstered confidence of Christian groups and just 2 days ago Indian Catholic Church openly appealed for defeat of BJP led coalition in upcoming Lok Sabha Elections. "The approach of Election Commission in dealing with is highly appalling, pathetic and unprofessional", Joshi comments. The LRO slams the ECI saying that, though this issue doesn't comes under EC, should EC had acted professionally in aforesaid issues, Church might not have dared to jump in to political arena so brazenly and aggressively. The letter also exposes the hyper sensitivity of the ECI by taking suo motu cognizance in many elections related issues. Vinay Josi hammers the 'stoic silence' in matters pertaining to Christian bodies which has brought the credibility of Election Commission at stake and the ECI must act swiftly to contain criminal interference of Christian Groups in Indian politics, says Joshi. Legal Rights Observatory has requested the ECI to urgently act on pending complaints against Church for meddling in political affairs in recent past, order Catholic Church to register at Election Commission as political party to fulfill its political agenda, to sensitize state election commissions regarding misuse of religion during elections, to investigate and prosecute latest Catholic Church statement against BJP led coalition in the backdrop of upcoming Lok Sabha and Assembly bye polls scheduled within next few days and to issue advisory to all Christian denominations in India against their overt as well as covert political activities. The upsurge of the BJP and a magnum Modi wave has deeplu upsetted the Cristian Groups who are gravely trying to nullyfy the Modi impact or Modi, more precisely. In April 2014, just one month before the 2014 Lok Sabha polls, it was the principal of St Xavier's College Father Frazer Mascarenhas published a letter addressed to students by criticising the Gujarat model of development and literalily directed students to vote against Narendra Modi and the BJP. In November 2017, ahead of the Gujarat polls, one insecured message was aired by Gujarat archbishop to the Christians. The controversial message was : Save country from 'nationalist forces!. In the letter to the Christians, Archbishop of the Archdiocese of Gandhinagar Thomas Macwan has said that "the nationalist forces were "on the verge of taking over the country", which is why the Gujarat elections could make a difference." In an official communique dated November 21, Macwan appealed to the Christians to organise prayer services in parishes and convents "so that we may have such people elected to the Gujarat assembly, who would remain faithful to the Indian Constitution and respect every human being without any sort of discrimination". "The democratic fabric of the country is at stake amidst growing sense of insecurity among the minorities, Other Backward Class, Backward Class, poor, etc," he said. But least was the impact of his conspicious letter. 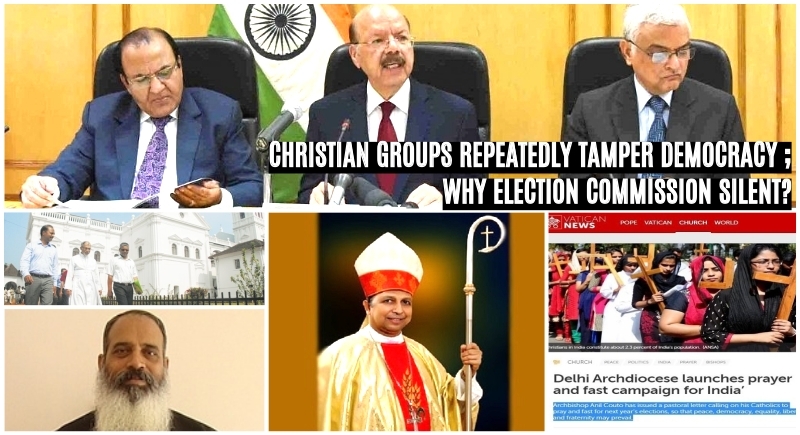 The LRO also complained to the Gujarat EC against the Gujarat Archbishop Thomas Macwan who appealed to the voters to defeat the “nationalist groups’ in the elections. But here also no action was taken, the LRO said. Similarly, the Catholic Church in Goa had caught itself in a political controversy when ahead of the Goa assembly polls in August 2017, a magazine of the Goa Church had appealed to Christian voters of Panaji to defeat Chief Minister Manohar Parrikar who contested the Vidhan Sabha by-poll from Panaji and won the election with 4803 votes. The magazine likened the NDA rule to that of Nazis in Germany and called for BJP’s defeat. An article published in the magazine said that the biggest issue in India today was freedom and not secularism or corruption. It implored the Christian voters to vote against the BJP candidate who agreed with fascism. It was the LRO which came forward to lodge a complaint with the Election Commissioner of Goa against the Catholic Church run magazine’s indulgence in violation of the Representation of Peoples (RP) Act 1951. No action was taken, thus forcing the LRO to shot another letter to Goa EC vide reference no. NGS-111084. In a similar pattern, in February 2018, head of the polls in Nagaland, the Nagaland Baptist Church Council (NBCC) went a step ahead asking the Nagaland voters to choose between the ‘Trishul’ and ‘Cross’. This time also the the LRO had protested saying that the Christian organisations and the Church in Nagaland had appealed to the voters to defeat the BJP but the EC again comfortably ignored this. All three instances were clear cut cases of violation of model code of conduct and EC should have booked the violators under RP Act 1951, the LRO said adding that the EC did not show the will to contain misuse of religious appeal in elections.